 When printing from Educa you might notice that sometimes content spills from one page onto the next, or the printout may include a header/footer with the page name. This article covers how to resolve these problems in the internet browsers; Google Chrome, Mozilla Firefox, Safari and Internet Explorer. This is likely to be caused by the printer's "margin" settings. If the margins are set too wide then the border won't be able to fit onto one page and it will spread across to the second page as well. See above image for an example. Below we give a detailed explanation on how to fix this for different browsers. But to summarise you need to update your "margin settings" to minimum or none. We recommend trying out both to see which works best for your printer. This is likely to be caused by the printer's headers & footers setting. This setting is usually turned on for web pages and will include the website's address and the name of the page. See above image for an example. Below we give a detailed explanation on how to fix this for different browsers. But this can usually be turned off with a simple checkbox. Take a look through the settings panel to find the 'Headers & Footers" checkbox. 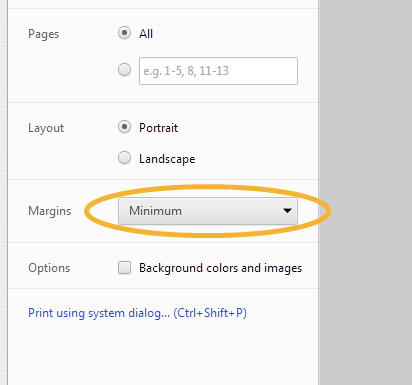 To make printing work the best in Google Chrome simply set Margins to Minimum on the print preview. Sometimes even after the above adjustment, Google Chrome may still have content flowing between pages. This can be caused when the Language of the computer is set to English (United States) as the default paper size is different under that locality. This can be remedied by changing the Language setting of the computer to English (New Zealand) or other appropriate Language. This can be done by typing "Region and Language" into the start menu and selecting the top option. Simply change the format from English (United States) to the appropriate language and restart the computer to update this. 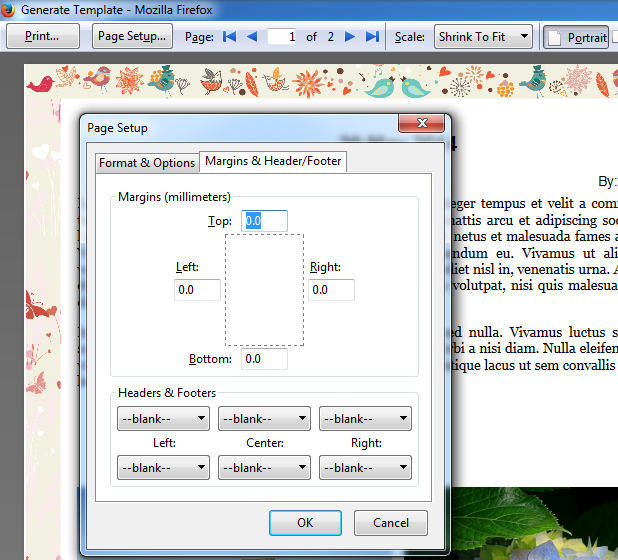 To remove headers and footers as well as large margins on Firefox you will have to use the print preview. This can be accessed by clicking the 3 bar button in the top right and selecting Print from the menu when you are looking at the generated print template. 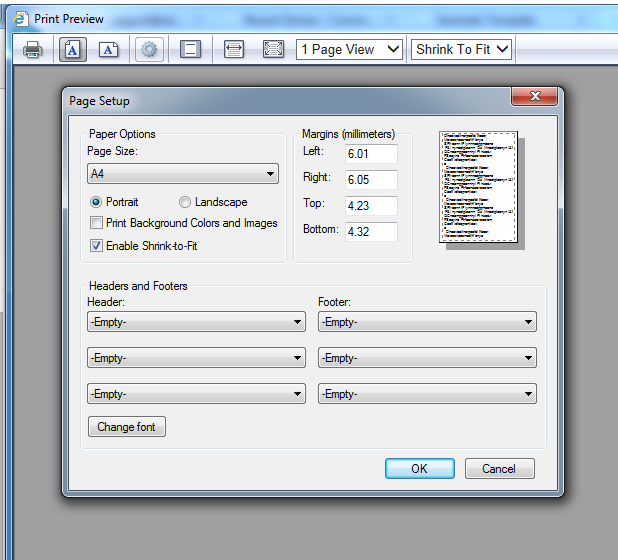 On the print preview you can click Page Setup... to access additional options. Select the Margins & Header/Footer tab in the Page Setup popup and set Headers & Footers to --blank-- to remove any page numbers or titles from around the story. You can also adjust the Margins to increase the size of the printed story. When printing with Safari simply untick the box Headers and Footers to remove them from the printout. Depending on the printer being used there may be additional options you can change to reduce margins around each page. To remove headers, footers and margins when printing with Internet Explorer you will have to use the print preview. This can be done by clicking the Cog icon in the top right corner of the browser, then Print then Print Preview. Once on the preview page, another Cog icon at the top will open the Page Setup window. Here you can set the Headers and Footers to -Empty- and reduce the margins.